We have three very active boys. VERY ACTIVE. There is a reason that they are all in gymnastics (Edric will start officially next week), they get to run, jump, climb, hang, spin, and everything else over safe mats and with a coach watching and helping along the way. They also sleep VERY well the night after gymnastics class. It has given them confidence and made them strong and they love it. 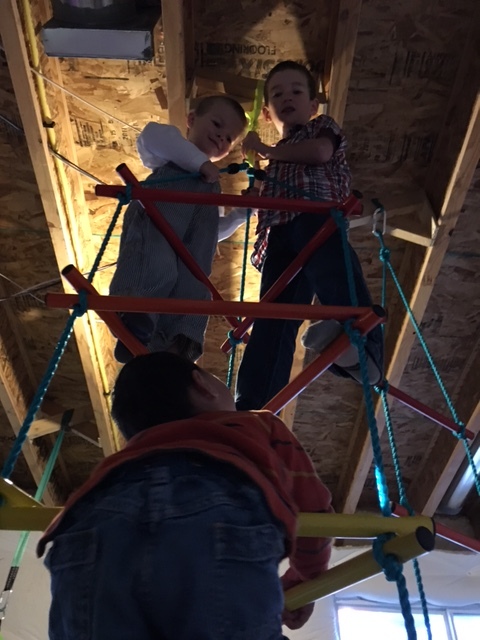 And so when we asked them what they wanted for Christmas Leighton said he wanted a rope to climb and Caedmon said he wanted a ladder to climb so he can practice being a “workerman”, Clint and I had to get creative. And so we came up with a plan for a part of the unfinished basement. Clint measured the rafters and sent the measurements off to our friend who is a structural engineer and he sent back plans for braces, and I researched and found some super thick foam to go on the ground (that ER doctor part of me is strong), we had the beginning of plans. Clint and my dad spent a Saturday building the braces while I took the boys to my mom’s to make cookies (which will be a post all on its own someday…making/decorating cookies with 3 young children….). We ordered mats, a rope, two ladders and were set. So on Christmas Eve night after getting the little guys down for bed we started our project. We laid all the foam out and then unpacked and unwrapped the foam flooring that we had ordered to go over the foam. We used both vinyl and carpet tape to secure it together and then place it down on the foam that was on the ground. 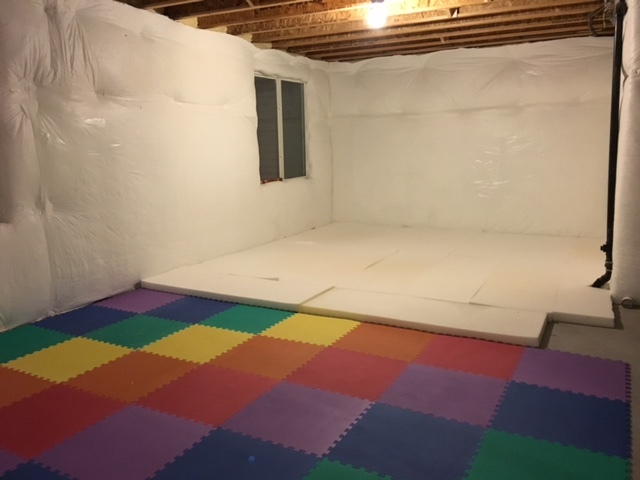 We spent a good 2 hours taping the flooring together, only to discover that with walking on it because of the 3 inches of soft foam underneath the colored flooring kept splitting apart at the seams. We tried everything and ultimately declared defeat. The funny thing was that Clint said “man, if we just had some big pieces of carpet to lay over the foam we could use that instead”. The best part was that we had a number of rolls of carpet pieces that we had been using on the basement floor before. 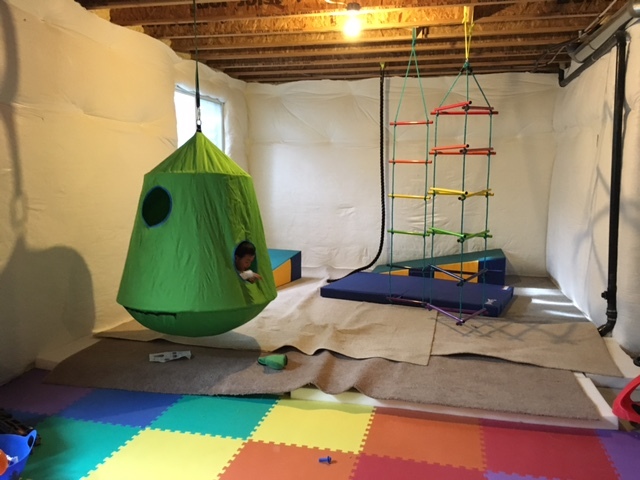 So we took all the tape off and moved the colored squares over to make a play area for toys and moved the carpet over the foam and it worked much better. 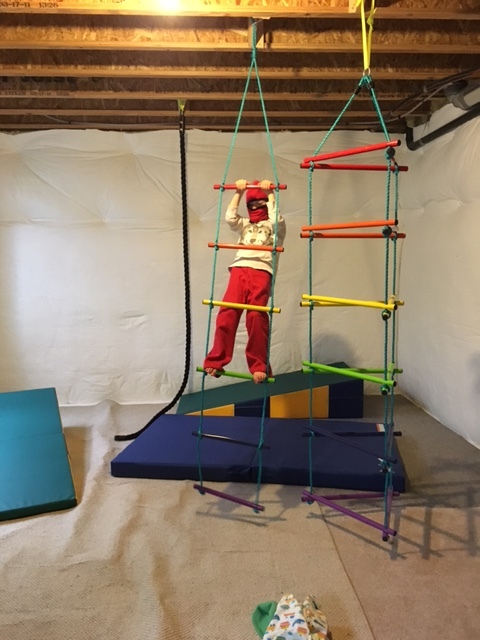 It didn’t take long then for Clint to finish hanging the ladders and rope and to unwrap the gymnastics mats while I cleaned up our mess. I think we made it to bed a little after 1AM. We heard the boys talking in the monitor at 6AM and while it was still dark got everyone up and down stairs to check out their stockings. We don’t really do Santa but still enjoy doing stockings. And then we had them close their eyes and head down to the basement. They were so excited and ran and jumped and climbed on everything. They have barely left the basement since that time. They love it. My parents got them a HugglePod which they sometimes call a hot air balloon or a spaceship depending on the day, to hang up as well. When I got home from my overnight shift this AM they met me at the top of the stairs and asked if I would come hold the ladder for them, and so there I was exhausted from a night shift holding ladders as they climbed and jumped in their church clothes. 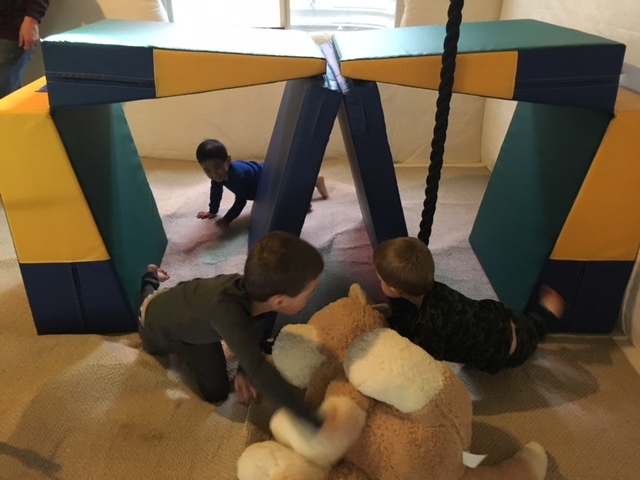 I have had fun running and jumping with them though as we pretend that the carpet is hot lava or as we escape from bad guys or build forts. It warms my heart to hear they excitement and shouts of joy as they run and play all around.